Initially designed by Erling Poppe - believed as a result of letters to a motorcycle magazine - it came on to the market in 1946 - straight after the war - a completely NEW concept in motorcycle design. Several versions were secretly tested at the factory in Redditch where they were made - which were intended to lead up to two productions types - the `Tourer' which came onto the market as the model S7 in 1946 - and the little known `Sports' which was tested but never put into production. This sports model had a much higher compression ratio with a different OHC design. 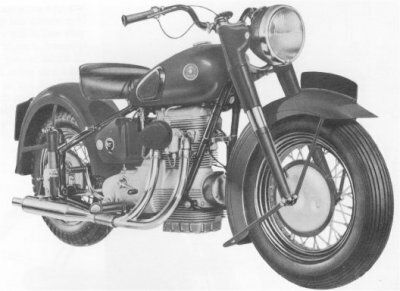 The S7 was road tested by `Motorcycling' in February 1946 and did a comfortable 75 mph. The never-sold sports model was road tested in May 1946 and gave 94 mph. Why it was not put into production was never officially disclosed. Rumour had it that-it produced too much BHP for the wellbeing of the components - notably the rear drive unit, although later evidence proved this rumour to be unfounded - others say it didn't handle too well - which; as these earlier versions had a rather more primitive undamped front fork system, and the rubber mountings for the Sunbeam hadn't been completely sorted out - could very well be true! There were also trials with a rigid version for a cheaper model - but this wasn't pursued either. 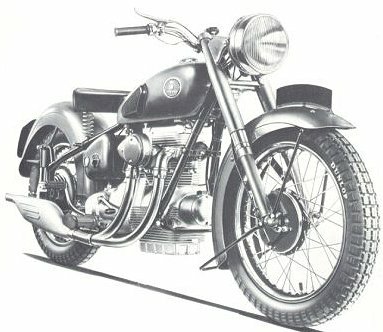 Erling Poppe was designing motorcycles in the 1920's. His father was one of the partners in White & Poppe of Coventry, who built engines for motor vehicles in the pioneering days. Erling started to design and build his own motorcycles in 1922. He sought always for better silencing, comfort and cleanliness. He went on to design cars and heavy vehicles until he designed the new concept which was to be the shaftdriven S7s and S8s. The famous name of SUNBEAM was started by John Marston when he set up in business in 1895 and produced the first Sunbeam vehicle, a car - in 1899. He produced the first Sunbeam motorcycle in 1912 and this long and successful line of singles was going strong when he died in 1918. A syndicate then took over the business and Sunbeams, including the legendary longstrokes, were produced until 1937 when A.M.C. acquired the interests. A.M.C. designed a completely new heavyweight single for 1939 but the war forced them into wartime work - and in 1943 they passed the Sunbeam name over to the B.S.A. group who were thinking up a new motorcycle for after the war. In November 1944 a `Forum' was set up inviting readers to give their ideas on the `machine of the future'. Erling Poppe was brought from the bus-building division of British Tramways to design it. It seemed inevitable that Poppe - now a car man - would think along car lines! The first handbuilt Sunbeam was made in 1945 with the engine bolted solidly in the frame. The production tester found the vibration far too severe and said it couldn't be produced in that form. However, the first few were actually sold (mainly abroad) with the engine so mounted and had to be hurriedly recalled for modification, but early in 1946 they were on the market with a vibration-free rubber mounted engine. 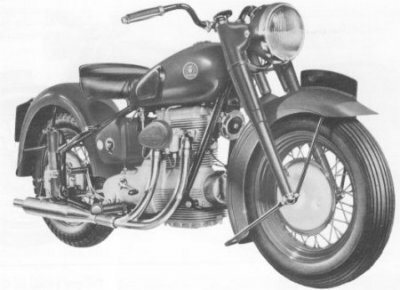 The first post-war motorcycle show was in November 1948 - and by this time the undamped forks of the S7 had been redesigned to give better handling, and numerous other minor alterations were made to generally improve the machine. It was called the S7-De-Luxe and made its first public appearance at the show, along with a new version called the S8. This was to be a lower-priced, slightly less sophisticated model, but lighter in weight - and hence faster and sportier to ride. It substituted the now distinct `fat wheels and tyres' of the S 7 with narrower more conventional wheels, narrower guards and lighter front forks, and was sold to the public from 1949. These two models went on virtually unchanged until actual production ceased in 1956. The opinion is that they died because they never continued to modernise the design. However, the standard finish was so high on the S7 and S8 Sunbeams - that perhaps they could do no more than halt production, if they were not to price themselves out or resort to shoddier manufacture. Whatever the reasons - there really has never been another machine like them and they must surely be one of the `great and innovative' British motorcycles - still sought after - and still widely ridden on a regular basis over 40 years after their demise.